Yesterday(July 3rd) the Armani Prive F/W Paris Fashion show took place in Paris during Paris Haute Couture Fashion Week. All of the guest were wearing GIORGIO ARMANI. Anya Taylor-Joy wore a SPRING 2018 mini dress which featured a color-block, sheer panel v-neck bodice and a black slit detail skirt. A pink lip color, a slick up-do and black ankle strap pumps finished up her look. Elizabeth Debicki wore a SPRING 2018 black & colorful beaded embroidered vest which was layered with a pink pleated peplum top and black trousers. The feather clutch added a playful touch to her look, while the black flats gave it a casual finish. Cressida Bonas looked great & she was the standout here in a SPRING 2018 COUTURE strapless colorful, sequin mini dress which she styled simply with black embellished sandals. 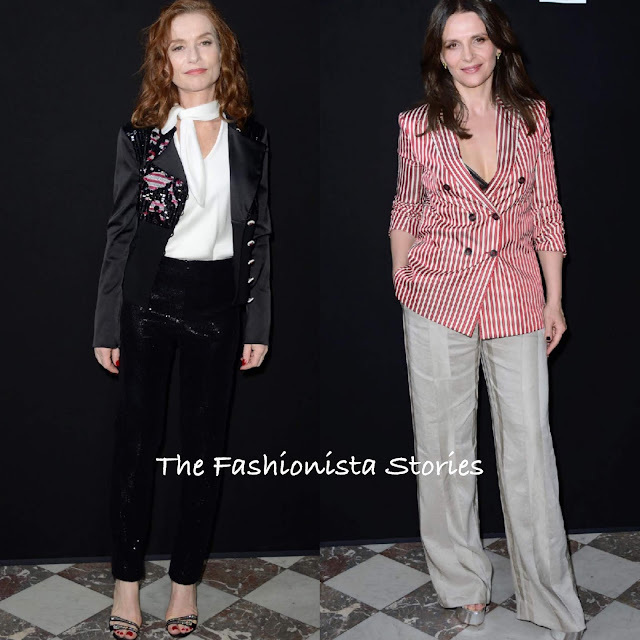 Isabelle Huppert looked great in a black beaded panel blazer, a white tie neck top and black sequin trousers, which she topped off with black embellished sandals. Juliette Binoche wore a red & white stripe blazer, which revealed a black bra underneath and which wide-leg trousers. I like her look but the unfortunate creases on her pants take center stage.